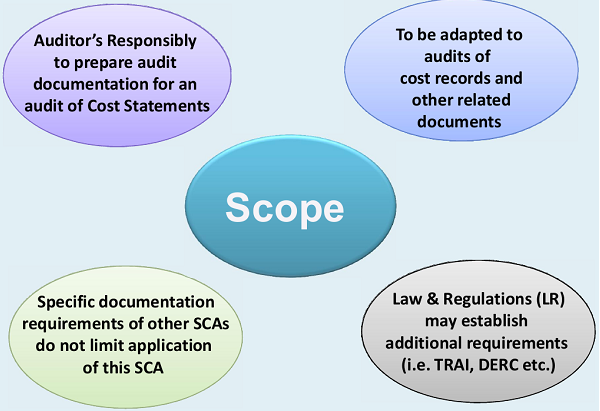 Requirements Outlines the specific requirements of SCA. Requirements containing the word “shall”, is mandatory (Bold Italic) to be complied with, unless stated otherwise The Non Bold Italic part of this section provide further explanation to relevant requirement. Application Guidance Provides further explanation of the requirements and guidance for carrying the requirements set out in the SCA. Statement of Modification SCAs are formulated based on International Standards on Auditing (ISAs) which primarily focus on financial audit. Due to fundamental differences between the scope and methodology of financial and cost audit, “Statement of Modifications” are issued by the Institute containing comparison to International Auditing Standards. Annexure / Appendices Appendices form part of the application and other explanatory material. The purpose and intended use of an appendix/ annexure are explained in the body of the related SCA, or within the title and introduction of the appendix/ annexure itself. Documentation is necessary to have proper evidence that the audit was planned and performed in accordance with SCAs and applicable legal & regulatory requirements. Cost auditor should document all matters, important in providing evidence to support the opinion given in the cost audit report. Documentation means the working papers prepared by and for, or obtained and retained by the cost auditor in connection with cost audit on paper, film, electronic or other media. 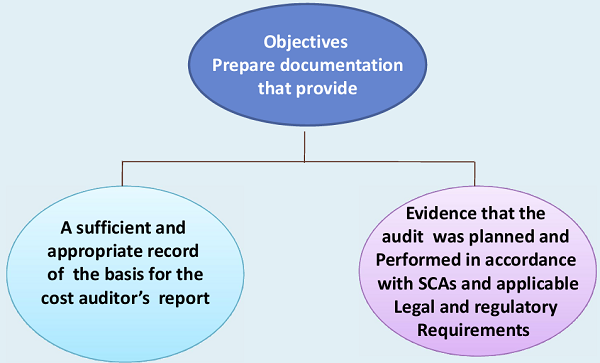 The standard prescribes that the cost auditor shall prepare documentation that is sufficient to enable other competent person to understand conformance to audit procedures and SCAs, results of audit procedures, audit evidence and significant matters arising during the audit. Cost Audit Documentation will usually contain checklist of compliances, audit programs, analysis, audit query list, abstract of significant relevant contracts, letters of confirmation, letter of representation, abstract of entity’s records etc. √ means the records, in physical or electronic form, including working papers. √ provides principal support for the representations, to assist in planning, performance and supervision of the audit engagement. √ Fundamental aspect of documentation is preparation or acquisition of working papers during course of cost audit. How the knowledge of business was obtained? Clarifications obtained from the client. The auditor may have executed appropriate audit procedures, however, if there is no documentation to prove, it is equal to having not done any work at all. Improper and incomplete documentation, at times, may even put the auditor in embarrassing situations. √ Facilitator of better understanding and helpful in avoiding misconceptions. √ Assisting the audit team to plan and perform the cost audit. √ Assisting members of the audit team responsible for supervision to direct and supervise the cost audit work, and to discharge their review responsibilities. √ Enabling the audit team to be accountable for its work. √ Retaining a record of matters of continuing significance to future cost audits. √ Enabling the conduct of quality control reviews in accordance with the Guidance Manual for Audit Quality issued by Quality Review Board (QRB). √ Enabling the conduct of external inspections in accordance with applicable legal, regulatory or other requirements. √ cost audit methodology and tools used. For example whether automated queries were used to get audit evidence from cost records. √ nature of the audit procedure to be performed. In particular, it is necessary to document the basis for a conclusion, not readily determinable from other documentation. For example: consumption of materials by a product vis-a-vis technical norms, normal price for a related party transactions. √ significance of the evidence obtained to the assertion being tested. 5.1 Shall record audit procedures performed, relevant audit evidence obtained, and conclusions reached. 8. Abstract or copies of the entity records. Minutes of audit team discussions, with names of members of audit team present, particularly of the audit partner when he is present. e) Significant matters arising during the audit, the conclusions reached thereon, and significant professional judgments made in reaching those conclusions. Matters that give rise to significant risks of a material misstatement are significant matters. Revision of the Cost Auditor’s previous assessment of risks of material misstatement. Conclusion Reached regarding material misstatement based on the availability of a well documented Bill of Materials but his assessment of risk may undergo a change if he finds that there is considerable use of substitute and alternate materials in the actual production process. Matters that cause significant difficulty in applying necessary audit procedures, for example heaps of bulk material in irregular shapes which make volumetric measurement of stock in a physical stock taking unreliable. Determining significant matters in an audit to warrant their inclusion in the documentation must be objectively done. Conclusions reached and application of professional judgment also needs to be documented. 5.3 Record the discussions of significant matters with client personnel and outsiders. Minutes of the meeting with Management, discussion with third parties seeking information or confirmation. 5.4 The Cost Auditor shall record any departure from the standard requirement in a Cost Auditing Standard. Cost Auditor shall document how the alternative audit procedures performed achieve the aim of that requirement, and the reasons for the departure. 5.5 In documenting the nature, timing and extent of audit procedures performed, the Cost Auditor shall record the characteristics of the specific items or matters tested, the persons responsible for performing and reviewing such procedures with relevant dates and extent of review. bills of contractors for supply of contract labour among others. 5.6 Prepare audit documentation on a timely basis. It helps to enhance the quality of audit. Documentation prepared after the audit work has been performed is likely to be less accurate than the documentation prepared during execution. 5.7 If, in exceptional circumstances, Cost Auditor performs any new or additional audit procedures or draws new conclusions, after the date of Cost Audit Report, then he shall document such circumstances and details of such procedures performed. Facts which become known to the Cost Auditor after the date of the audit report but which if known earlier would have caused the cost statements to be changed or the Cost Audit Report to be modified should be added to the Cost Audit Documentation. The resulting changes to the audit documentation must also be reviewed as the original documentation. 5.8 Assemble the audit documentation in an audit file. Audit Documentation should be retained for at least ten years. Note :-Section 128(5) of the Companies Act 2013 provides a period of not less than eight financial years immediately preceding a financial year, or where the company had been in existence for a period less than eight years.